JettaClean – Jet Wash Services operate a clear and affordable pricing structure that we believe offers excellent value for money there is absolutely NO vat to pay on our prices! It’s that time of the year when the moss and leaves have fallen into your gutter. Don’t be caught out with blocked gutters which can cause problems this season. Give us a call to have your gutters cleared. All our work is carried out with high powered industrial equipment, you can rest assured you will see amazing results. Our high pressure rotary cleaning equipment can clean almost any surface including block-paving, natural stone, crazy-paving, concrete slabs, tarmac, pattern imprinted concrete and timber decking and more. All vehicles are fitted with water storage tank, which allows them to professionally pressure clean any surface anywhere. JettaClean has public liability insurance of up to £5 Million pounds which also includes damage to the property we were working on, a copy of this is available on request. 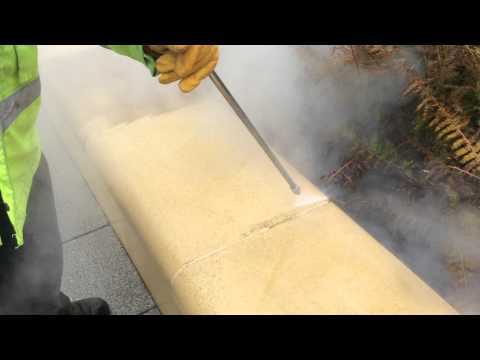 What can our low pressure high temperature masonry cleaning system be used for. Graffiti Removal at T.K.maxx Swindon.